For the CAS leaders we were given the option of a side trip involving a off campus investigation to the Hougang Care Center for the college service, Tech Tinkers. Tech Tinkers is an activity based on 3 basic steps of action: acquiring tech , renewing tech, and finding new homes of need for tech. The main objective of the trip were to scout out options regarding the benefit of both the activity and center itself; we, as an activity, wanted to free up our hands on technology, we wanted to figure out, if they needed any updates on their computer center: new equipment/software, or technology repair. This was an important journey as it firstly helped us understand the specific needs of the organization; what we found was that they didn’t necessarily require our assistance. From the prior knowledge before the trip, we assumed that their computer labs were in desperate need of repair and replacing. But after talking with a member we learned that they actually are much better off than we anticipated, their machines worked fine and they had ample accessories & software. 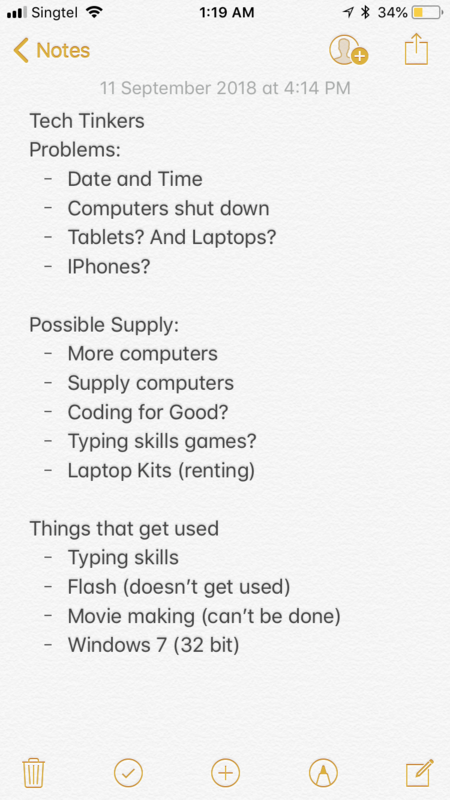 Due to this new knowledge we had to reassess our plans towards helping; on the site we held a brainstorm and proposed multiple other ideas, such as giving working phones and laptops that the center could use to rent to “members” in need. Another idea we had was to involve Coding for Good (another College service) to help create software to improve “members” typing skills, Tech Tinkers would supply the hardware and Coding for Good with the custom software. Through this trip, outside of activity and school hours, we had the chance to communicate with the local service itself giving us a deeper understanding on how we can assist to our full potential. From this learning we had to adapt to their needs and change our original plan, using critical thinking in brainstorms to think up quick preposed solutions. Overall it was an insightful and useful trip, which benefitted all of the stakeholders involved.